Like flourishing green foliage, this return address label design featuring a natural green and overlapping pattern is refreshing and full of life. The eye-catching motif was created using the artistic method of stippling. Tiny dots arranged by the artist have the appearance of a lush treetop. But the best thing about these labels is that they are self-adhesive. That means no more messy handwriting on your mail, and no more licking and sticking labels either. You simply peel and place them on anything you hand to Mr. Postman. 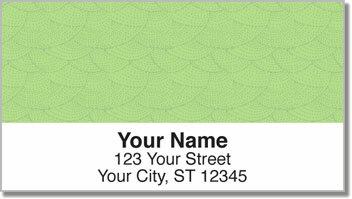 Make Green Stipple Address Labels from CheckAdvantage yours today! This selection is also available in three other colors, or you can get a set with all four shades.